How long have you been in the Recruitment Industry? What attracted you to Avanti? Great opportunities for career development and the earning potential. We regularly have holiday incentives which are a great motivation for everyone to push themselves that little bit further. I thought I had narrowly missed out on going to Las Vegas… until the last day of the incentive when I secured the final deal which put me on the plane to Sin City! I celebrated straight away but joining straight on lunch club. It goes to prove you should never give up in recruitment! Growing my team from 2 consultants up to 8 consistently billing consultants within a year. 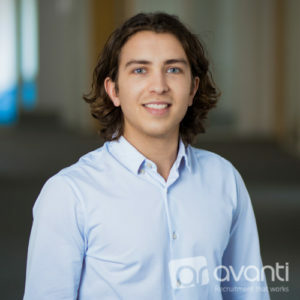 Why would you recommend a career at Avanti? There is a clear career structure which is explained from the start. People are promoted based on their billing and ability not on length of service so if you’re driven you can get promoted quickly. It’s down to you.